The creation of a film, like any journey begins with a vision. When we began principal photography on May 30, 2013, just over two years ago, (the speed of light for a doc film,) and though I didn’t know Coach Calhoun very well, I sensed it was going to be an incredible journey. And it has been. When I returned home the next morning after an eighteen hour day of shooting, I wrote on my kitchen chalkboard the two phrases that personified my initial impressions of this intense sports icon. 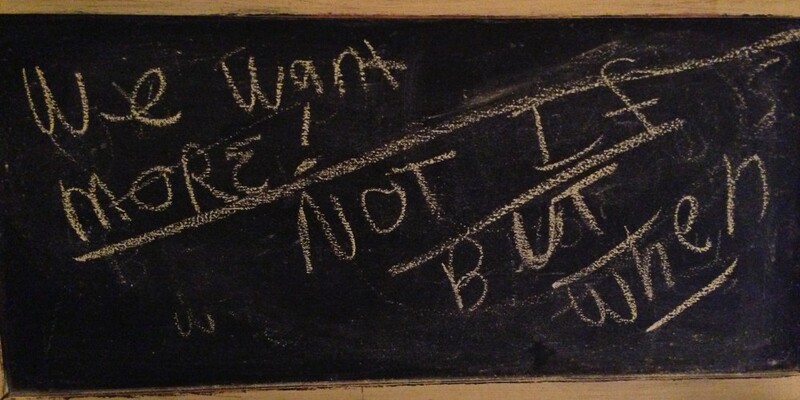 I vowed not to erase them until the film was wrapped and premiered. Yet they remain untouched. “We want more,” reflects Coach Calhoun’s mindset to life, his players, and his vision. For me, “We want more” translates into you have to give more, you have to expect more, and you have to be more. And if you work at it, minute by minute, practice by practice, day by day, not without setbacks or disappointments, the fruits of your hard work will bring a great harvest of victories and accomplishment. By giving more, you will become part of something bigger that yourself, often something you could have never imagined. But who is we? When Coach asked more of his players, I believe he meant the UCONN family, fans and the community that was built through a top level basketball program. “We” is also the legacy of his players, how they carry themselves whether it is in life, coaching, the NBA and international basketball leagues. Making this film made we wish I could have played for him, but as a 5’ 8” female, with very limited basketball ability that was never to be my destiny. But maybe the destiny was the faith that I found in understanding his passion, intensity and commitment. I never expected that making this film would have such a profound effect on me. I often wondered, what if everyone in everything they did, gave more, more to their families, more to their efforts, their work, their compassion to loved ones and even strangers, what kind of a world would this be, could this be? As a first time documentary film maker, with lots of experience in Fortune 100 project management, I thought making this film would be a lot easier than it turned out. Raising funds in the shadows of the 2013 post season sanctions posed challenges, not to mention the attitude that every rabid fan thought they knew everything there was to know about Coach Calhoun and his program. What was left to tell? I cannot imagine what Coach Calhoun envisioned upon his first few weeks at UCONN, but we can now see and have documented the challenges and fruits of that vision. When you have such faith and commitment to your passion indeed all things are possible. How would we all act if we truly believed that our vision would become a reality? Would we be more inspired ? Would it make the journey easier? “It’s not if it’s when” also refers to my faith in this project, in the Director/Co-Executive Producer: Chris Martens, the crew, and everyone who helped us along the way. As I have repeatedly stated, giving up on making a film about a Coach Calhoun who never gives up on his team, would have made us the biggest hypocrites ever. Thank you Coach for providing us with unlimited access, authenticity and faith in our work. I have yet to erase the chalk board, though I probably will need to as another film project waits in the wings, or dragon to slay or another mountain to climb. And as I think about it, it’s okay to erase the chalkboard as those phrases are indelibility imprinted in my mind and in this film.